Cook until edges are dry. Turn; cook until golden. Cook these cakes on a true cast-iron griddle or in a large cast-iron skillet. Use a 1/4-cup measuring cup to scoop the batter onto the hot pan (it’s ready when a drop of water sizzles on the surface), then don’t turn them until they puff up and bubbles form on top. Flip them just once, cooking until just golden brown. Rather than stirring ingredients into the batter, spoon a little batter onto the griddle then add sliced banana, raspberries, blueberries, or bits of a good chocolate bar, then top with another spoonful of batter. Then no one gets short-changed and every cake is filled with extras. Mix pancake batter in a measuring cup or bowl with handle and spout. Then you can easily pour batter onto a griddle. Don't flip 'em more than once! 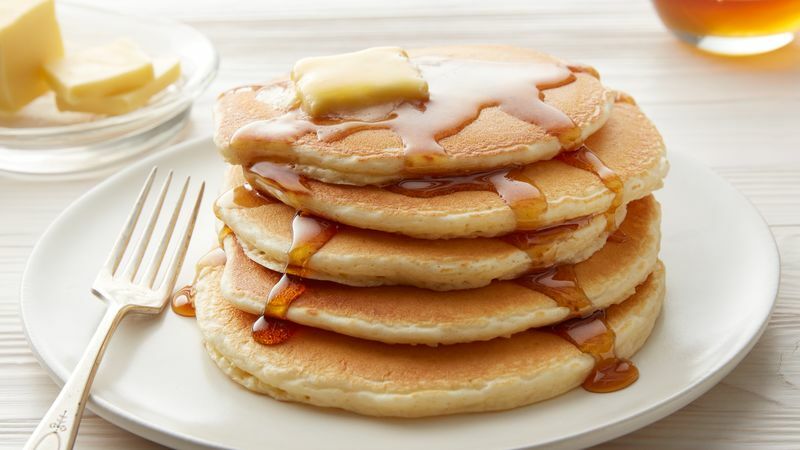 Repeated cooking on both sides toughens rather than browns the pancakes. Keep pancakes warm until ready to serve by placing them uncovered in a single layer on a paper towel-lined cookie sheet in a 200°F oven. Freeze leftover pancakes stacked between sheets of waxed paper, then wrapped in foil or a plastic freezer bag. Pop a couple unwrapped cakes into the toaster, spread with peanut butter mixed with some maple syrup, and send them out the door with the kids. If you like thin pancakes, use 1 1/2 cups milk. Sure, pancakes taste great when you’re enjoying a leisurely Sunday brunch at your favorite weekend hangout. But they’ll taste just as great if you get to stay in your pajamas, mix up three simple ingredients, and cook these hot, fresh Bisquick™ pancakes for yourself. If you'd rather make them from scratch, our How to Make Pancakes guide has you covered. It includes the equipment you’ll need, gluten- and dairy-free options, how to store leftovers, how to make them ahead, and even special occasion ideas like Red Velvet Christmas Pancakes with cream-cheese and an Easter Egg DIY pancake-decorating station. Once you’ve mastered this easy pancake recipe, check out more traditional favorites, intriguing variations and fresh new takes in this collection of Betty’s Best Pancakes Recipes.